Burst is a new Reddit client for iPhone with a unique goal: bursting the filter bubbles we can all find ourselves in. Recent political events around the globe highlight how harmful it can be to society when people are only exposed to news from one perspective. The same piece of news can be spun into two polar opposite stories by differing political parties, leading each opposing side to remain, at best, misunderstood, and at worst, demonized. To lesser degrees these divisions extend to other areas of life too, such as technology debates between iOS and Android users, or even, to get a little more relevant to our audience, iPad and Mac users. In all these cases, Burst makes it easier to see the thoughts of people outside your normal online circles in an effort to broaden the array of perspectives you're exposed to. Reddit purchased third-party client Alien Blue in 2014. This past Spring, Reddit launched its first official client. Many of Alien Blue's features found their way into the official client. However, one notable exception was iPad support. As a result, Alien Blue for iPad remained on the App Store and, in fact, is still there. Reddit's iPad version (right) adds wide margins to the content. Today, Reddit updated its official client to support the iPad. The UI of the iPad version is the same as the iPhone version, but with margins added to the left and right sides of the screen to avoid it looking like the content is stretched out. As a result there is a lot of white space if you use the app in landscape mode. I would have preferred to see a more creative use of the iPad’s added screen real estate, but the update is still better than using the scaled-up version of the iPhone app. For a long time, Reddit was unique among large online communities for its lack of an official mobile client on any platform. That gap was filled by third party developers who made popular Reddit clients like Alien Blue and Narwal. Then in 2014, Reddit purchase Alien Blue, which has been the official Reddit client for the last 18 months. 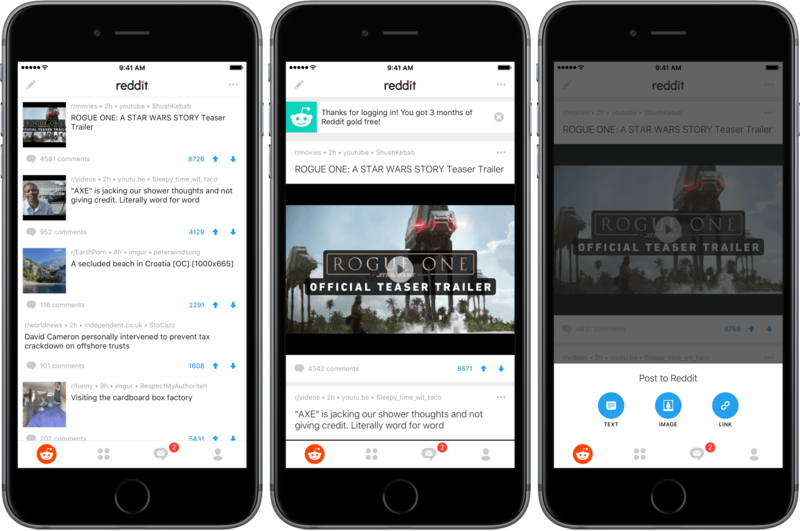 Today, Reddit launched a new official iOS client called appropriately, Reddit. 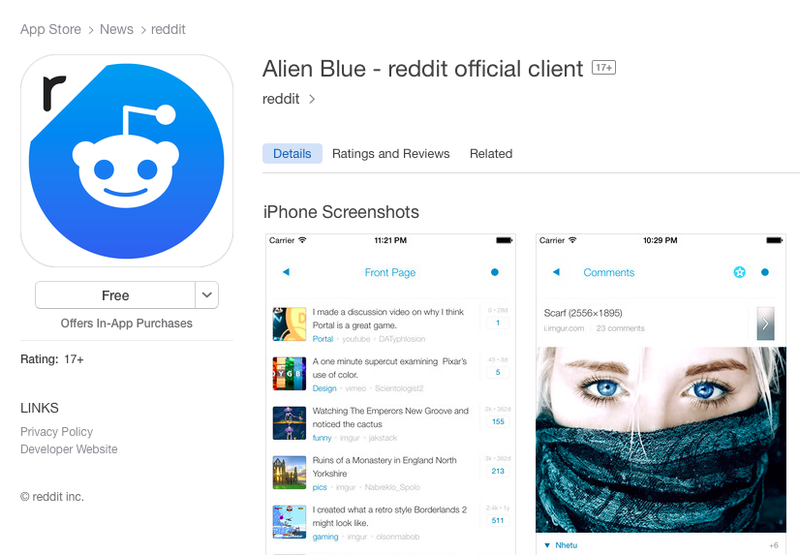 At the same time, Reddit has removed the iPhone version of Alien Blue from the App Store. The iPad version of Alien Blue remains in the App Store and is free because for now at least, Reddit is iPhone only. 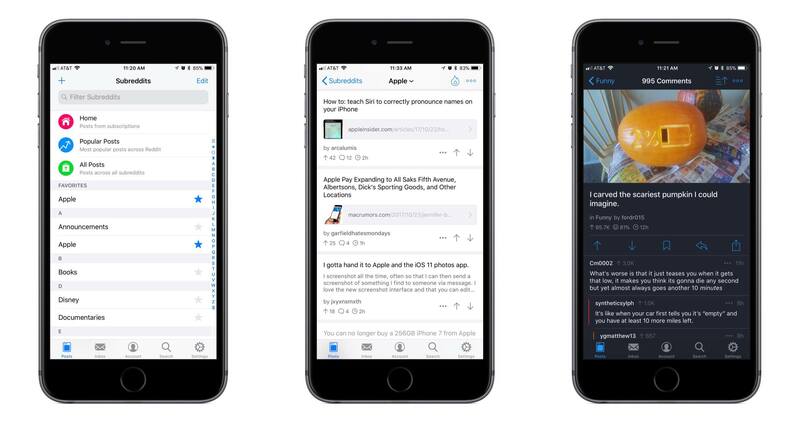 Some of the highlights of the new Reddit app include card and compact views, a dark mode called ‘Reddit night’, which was also available in Alien Blue, a ‘safe for work browsing’ toggle, and support for multiple accounts. In addition, if you log into Reddit during launch week, you get a free three-month trial of Reddit’s gold membership, which is normally $3.99/month or $29.99/year. Based on my initial use of the app, Reddit is a solid debut. The card view is nice for browsing media, but switching to compact mode is great for skimming through lots of items quickly. I also appreciate the inclusion of a night mode. Reddit, which is iPhone only, is available for download on the App Store for free. Nice move from Reddit (via MacRumors): if you bought a Pro upgrade for Alien Blue (which was acquired by Reddit in 2014), the latest update will get you a four-year Reddit Gold subscription for free. I realize that I'm spending quite a bit of time on Reddit each day (some subreddits can be surprisingly civil and informative), but I never really considered the Gold membership. It's got some intriguing perks. We heard whispers of this deal going back a few weeks. While reddit isn’t disclosing terms, they’ve just confirmed to me that they’ve acquired the Alien Blue project and that its Melbourne-based developer, Jase Morrissey, will be joining their team. Curiously, reddit seems to hesitate in calling the app their “official iOS reader” — they’re keeping the “Alien Blue” name, for example, rather than changing it to just be called “reddit” or “reddit reader” or something. I've covered Alien Blue several times here at MacStories over the past five years – it's always been a fantastic Reddit client packed with nice design touches and powerful functionalities to customize the way you read Reddit, browse sub-reddits, and interact with comments. It's interesting to see Reddit acquiring a power-user app such as Alien Blue rather than more simplistic and minimal clients, and it makes me wonder if the company will keep on adding features for reading and user management, or if they'll begin to simplify the app and remove its advanced features (always been a fan of subreddit grouping and iCloud sync in the app). Alien Blue joins the dedicated Reddit AMA app on the App Store, and it's available in two versions for iPhone and iPad; Reddit is keeping the app's "Pro" In-App Purchase, but to ease the transition to the separate app, they're offering it for free for a limited time.